Nancy Langston, Sustaining Lake Superior: an Extraordinary Lake in a Changing World. 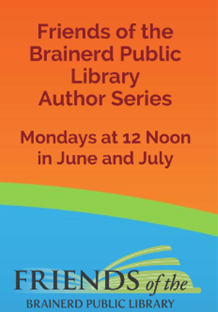 Join the Friends of the Brainerd Public Library Mondays in July for an author talk. No registration necessary, just bring a sack lunch or enjoy the light refreshments provided.